When the price of oil was above $100, many of the less developed oil exporting OPEC members decided to capitalize on the high price and cash out by taking loans using the precious liquid as collateral very much the same way corporate CEOs use their inflated stock (thanks to buybacks they authorize) to issue loans against said stock. And why not: even if the price of oil were to drop, they could just pump more until the principal is repaid. However, few oil exporters anticipated such an acute oil plunge in such as short time span, which resulted in the value of the collateral tumbling by 70%, and now find themselves have to repay the original loan by remitting as much as three times more oil! According to Reuters, this is precisely what happened in the years preceding the great 2014-2015 oil bust: "poorer oil-producing countries which took out loans to be repaid in oil when the price was higher are having to send three times as much to respect repayment schedules now prices have fallen." As a result, the finances of countries such as Angola, Venezuela, Nigeria and Iraq have been crippled, in the process creating further division within the Organization of the Petroleum Exporting Countries. But while these already poor and corrupt OPEC nations were the biggest losers, one country was a huge winner, the country that provided the billions in virtually risk-free, oil-collateralized loans to any country that requested them. China. The same China which has once again proven smart enough to not demand repayment in fiat but in physical commodities, be they oil, copper or gold. Take Angola for example: Africa's largest oil producer has borrowed as much as $25 billion from China since 2010, including about $5 billion last December, which according to Reuters forced its state oil firm to channel almost its entire oil output toward debt repayments this year. Or Venezuela: ever since 2007, China, which has become Venezuela's top financier via an oil-for-loans program, has funneled an amazing $50 billion into the Chavez first and then Maduro regimes, in exchange for repayment in crude and fuel, including a $5 billion deal last September. While details of the loans have not been made public, analysts from Barclays estimate Caracas owes $7 billion to Beijing this year and needs nearly 800,000 bpd to meet payments, up from 230,000 bpd when oil traded at $100 per barrel. Many other countries have borrowed money from China (and others such as producers Exxon, Shell and Lukoil, as well as traders Vitol and Trafigura) and promised to repay in oil included Nigeria, Iraq, Venezuela and others. Fast forward to today when Angola, Nigeria, Iraq, Venezuela and Kurdistan are due to repay a total of between $30 billion and $50 billion with oil, Reuters calculates. Repaying $50 billion required only slightly over 1 million barrels per day (bpd) of oil exports when it was trading at $120 per barrel but with prices of around $40, the same repayment would require exports of over 3 million bpd. This is terrible news for all the indebted exporters because not only do they now have to pump three times as much just to repay the same loan, they have little if anything left over to fund critical budget needs and certainly nothing left over to invest. "All of those oil nations – Angola, Nigeria, Venezuela – have taken money for survival but haven't got any money left for investments. That is very damaging to their long-term growth prospects," said Amrita Sen from Energy Aspects think-tank. "People tend to look at current production volumes but if you have committed your entire production to China or other buyers under loans – then you cannot invest to keep growing and won't benefit from higher prices in the future." While the poorer OPEC exporters find themselves pumping unprecedented amount just to stay afloat, the rich OPEC producers have understandably stayed away from debt: according to Reuters, OPEC's Gulf Arab members - Saudi Arabia, the United Arab Emirates, Kuwait and Qatar - have very few joint ventures with oil companies, do not have pre-payment deals with China and do not need to borrow from trading houses. And so, while Saudi Arabia saw every dollar from its oil sales going to state coffers, the poorer members had a large part of their oil revenue eaten up by debts - read China - leaving no money to invest in infrastructure and field development. As a result, Nigeria and Venezuela are now facing steep production declines at a time when Saudi Arabia is preparing to further ramp up supplies as it invested heavily in new fields. First, it gives another reason why OPEC is effectively defunct as a result of Saudi Arabia's resistince to reduce output. Quite simply, the lack of debt means it is able to use the money for development and reinforce its dominant position in oil markets. Nigeria and Venezuela, meanwhile, are desperate for a deal that would reduce output and push up prices to help them invest in oil fields and repay fewer barrels to creditors. "It may ultimately be mounting supply disruptions in stressed states, rather than collective cartel action, that causes an accelerated market rebalancing,” RBC Capital's head of commodity strategy Helima Croft said. Second, and maybe even more important, it explains why China suddenly finds itself flooded with so much oil, the country has unleashed its teapot refining army into overdrive. More importantly, it may shift the entire dynamic of China's soaring imports on its head, because according to Reuters, the reason why China is being flooded with oil has little to do with a surge in demand, but because OPEC exporters are forced to ship far greater amounts of crude to China! In late February, the tanker Jag Lok loaded oil from Equatorial Guinea in western Africa and set sail for the Chinese port of Qingdao, the gateway to the world’s newest buyers of crude, a journey of more than 12,000 nautical miles. After reaching its destination in early April, the ship churned in circles for 20 days before it got a chance to deliver its cargo. 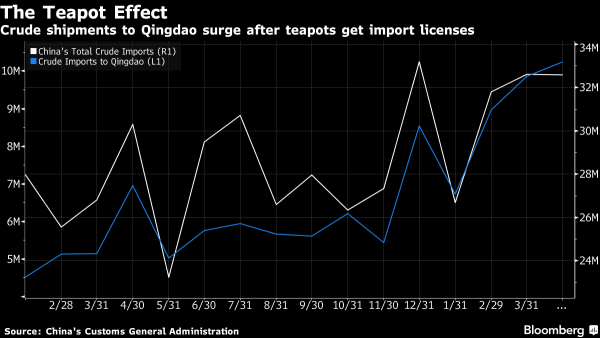 That’s because the port in Shandong province was struggling to handle a record number of vessels arriving to supply the privately held refineries called “teapots” that dot the region, ship-tracking data compiled by Bloomberg show. What is ironic is that Bloomberg, as one would expect before reading the Reuters piece, confuses cause and effect, and attributes the surge in Chinese oil traffic to soaring demand, when in reality much of it is about exporters seeking to repay their debt to Beijing as fast as possible. The backup illustrates the challenges facing the independent refiners, which have emerged as a bright spot of rising demand amid a global glut. The processors are forecast by ICIS-China to purchase a combined 1 million barrels a day of crude from overseas this year, up from 620,000 barrels in 2015. While small individually, together they account for almost a third of China’s refining capacity. Any curb on imports would threaten oil’s rebound from a 12-year low, according to Nomura Holdings Inc. and Samsung Futures Inc.
From being dependent on state-owned energy giants for their feedstock needs as little as a year ago, teapots are now driving Chinese crude purchases after the government allowed them to buy overseas supplies directly. As of end-February, 27 of the companies had received or applied for annual import quotas totaling 89.5 million metric tons, or about 1.8 million barrels a day, according to Zhang Liucheng, chairman of the China Petroleum Purchase Federation of Independent Refinery, a group of 16 processors. Total purchases from overseas into the world’s second-largest oil user climbed to a near record 7.96 million barrels a day in April, while shipments to Qingdao surged to unprecedented levels in April. And much of this traffic may have nothing to do with current Chinese purchases, but everything to do with tens of billions in loans China has issued in prior years which are only now being repaid in the form of what is effectively free oil. With infrastructure not developing as fast as oil purchases, imports are at risk of slowing because of the ship traffic and lack of storage capacity, according to BMI Research. Concern about the creditworthiness of companies with no prior experience in international trade is also deterring some sellers. Slowing refining profits mean the plants may have to cut processing rates, weakening their appetite for cargoes from overseas, while the implementation of higher fuel quality standards could force some of them to shut. "Teapot buying could slow due to logistical constraints which are already stretched to their limits,” said Nevyn Nah, a Singapore-based analyst at consultant firm Energy Aspects Ltd. The summary is fascinating: China is being flooded with oil, on one hand due to ongoint purchases, but to a large extent because its oil-exporting counterparts (who need to remain on good terms with lender of last resort China) are scrambling to repay their Chinese loans by shipping out record amount of oil in the direction of China, so much so that even China's infrastructure can no longer handle the inbound traffic. As Bloomberg notes, "ships continue to be held up at Qingdao. At least 16 oil tankers with capacity to carry 21.2 million barrels have stayed near the port for more than 10 days over May 1-23. Half of them were there for more than a month." How this unprecedented dynamic plays out, is at this point impossible to predict, but with such dramatic pockets of zero-sum inefficiency, where half of OPEC-loss is China's gain, we eagerly look forward to the conclusion and how it will impact the price of oil.